Enter the tropical haven of The Bahamas archipelago. Each with sugar white beaches, glistening ocean and an excellent array of activities – each island promises, and delivers, paradise. Island hop between some of the most beautiful and deserted beaches in the world. Nassau island is the glamorous, lively capital of the Bahamas. 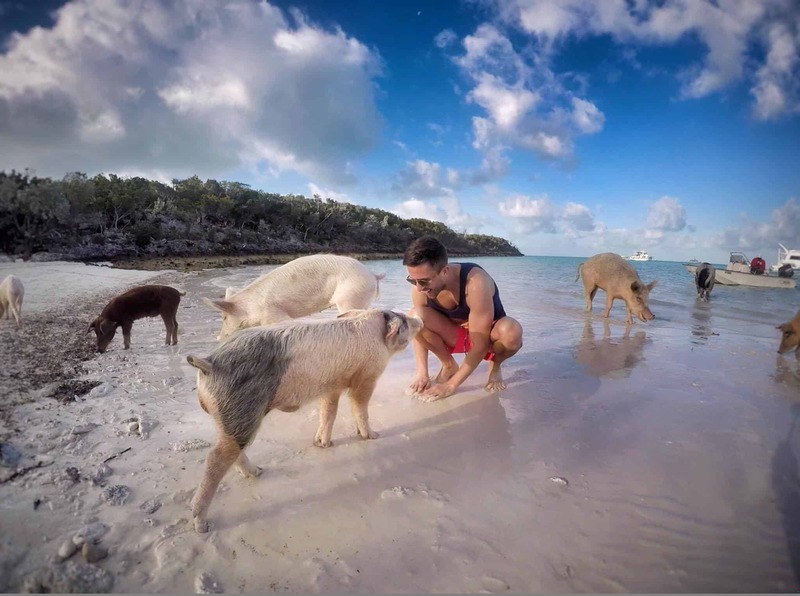 The Exumas is home to the renowned ‘swimming pigs’ on pig beach – a sight you probably won’t see anywhere else. Relax on the phenomenal pink sand beaches of Harbour Island. Nassau Island, the capital of the Bahamas, is a buzzing metropolitan island that has the energy of a city coupled with the tranquillity of pristine beaches. A thrillseekers paradise, you can turn your hand to watersports or visit the fun-filled Aquaventure waterpark. A haunt of the rich and famous, Nassau also has excellent designer shopping. An abundance of duty-free shops and straw market are nearby to a fantastic selection of exhibitions and artefacts. We’d thoroughly recommend the Pompey Museum which looks back at the history of slavery in the region. The Bahamian art galleries are also worth a visit for those who like contemporary art. The world-famous Atlantis hotel is one of the biggest in the world and comes with an excellent array of facilities, including casinos and a golf course. Today you will fly to The Exumas made up of 365 cays and islands divided into three main areas. Great Exuma and Little Exuma are best known for their laid-back vibes, whilst The Exuma Cays boast the majority of the luxury homes, resorts and condos of the rich and famous. Pelican Beach is the longest and most pretty stretch of sand on Little Exuma. Visit the quaint Georgetown which is the capital on Great Exuma and sample some delicious fresh conch on Stocking Island. Chat ‘n Chill is a lively, open-air beach bar and restaurant where you can dance the night away. Moriah Harbour Cay National Park includes natural sand dunes, seashell rich beaches and mangroves. The seabirds and other marine life are abundant here making this a vital part of the ecosystem. One sight not to miss is the swimming pigs on Major’s Spot Cay. In anticipation of food, the pigs swim out to boats as they approach. 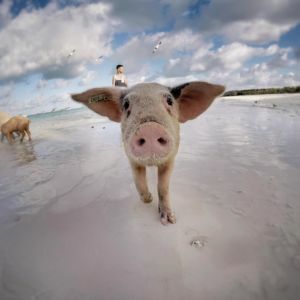 No-one is really sure how the pigs ended up here, but it’s certainly a spectacle that you probably won’t see anywhere else and a great photo opportunity. Harbour Island’s famed Pink Sand Beach has a fairytale rose hue. This unusual natural phenomenon is caused by shells of tiny marine invertebrates mixed with broken down coral and calcium carbonate. Although far from a fairytale explanation, magical experiences are abundant on the quaint Harbour Island, surrounded by enticing aquamarine waters. The charming, pastel-coloured homes and quaint New England architecture is a reminder of the influence by Loyalist settlers in the late 1700s. Sample one of the sweetest pineapples in the world growing in abundance across Eleuthera. Many of the beach-fronted luxury 5* properties will give you the opportunity to indulge in ultimate relaxation. Spa treatments galore, sumptuous food and great watersports make for one of our favourite beach destinations.